Make no mistake, living la vida low-carb ain’t a cake walk (pun very much intended). But every so often, you stumble upon a low-carb version of a favorite treat that is just as delicious as its high carb counterpart. Thank you, Universe, for those moments. 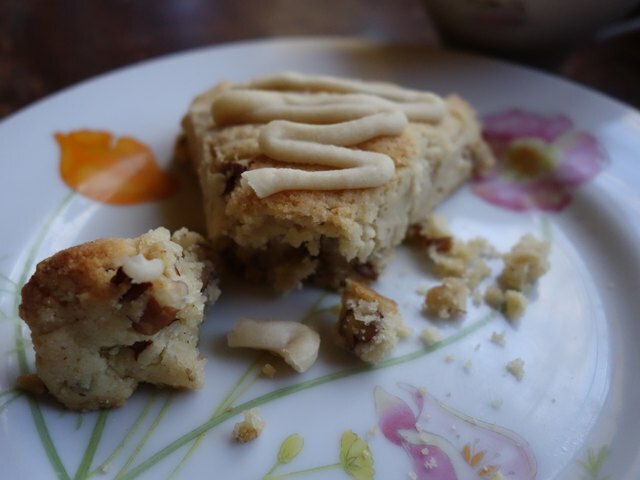 Here’s a recipe that I think fits the bill -- low-carb maple pecan scones that are gluten-free, grain-free, and have no added sugar. Made with almond flour, coconut flour, and a hint of maple extract for that beloved syrup flavor sans the carbs, these moist-yet-crumbly scones may actually be better than the real deal! I kid you not. And at around 4 net carbs per scone, they’re truly the stuff a low-carber’s dreams are made of. 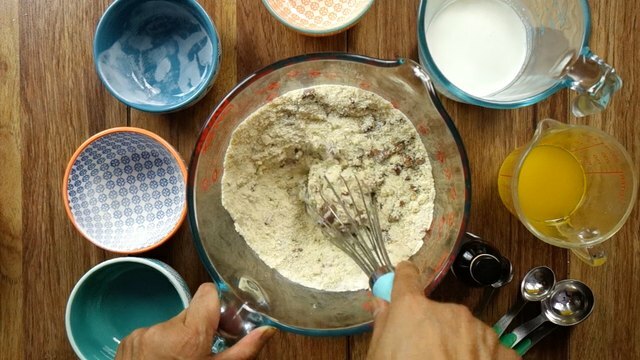 Preheat your oven to 350° Fahrenheit, then using a whisk mix the flours, granulated sweetener (I prefer Swerve brand erythritol) baking powder, pecans, and a pinch of salt until well combined. 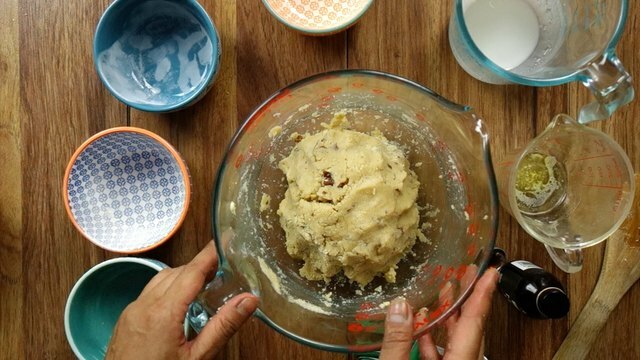 Add butter, cream, and one teaspoon of the maple extract, and then mix to form a soft dough and pat into a ball. 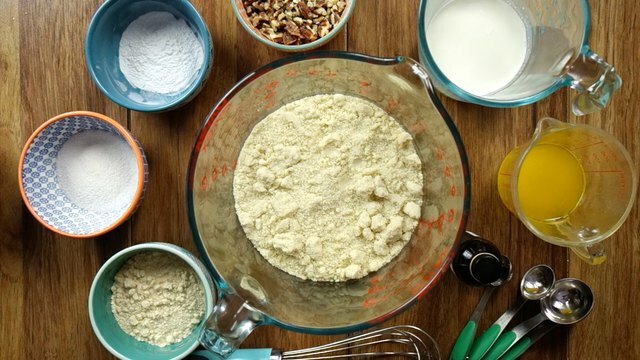 Before shaping your dough into wedges, cover your baking surface with coconut flour to prevent sticking. 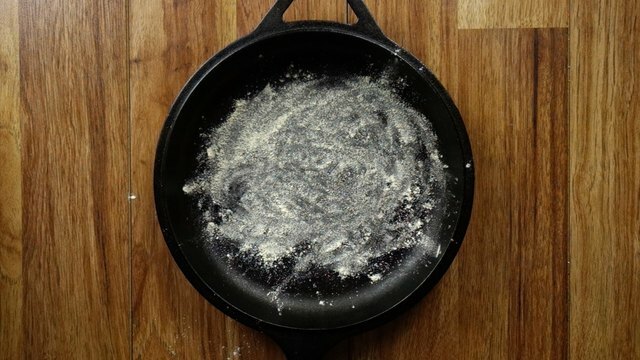 I use a cast iron skillet, but you can use a baking sheet lined with parchment paper. 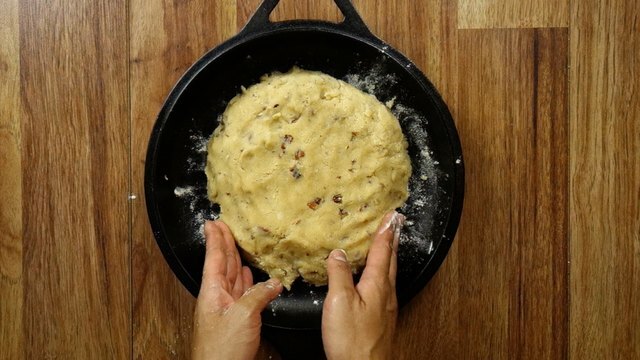 Place your ball of dough on your baking surface and pat down to form a round, approximately 7 inches in diameter. Using a knife, cut 8 wedges as if slicing a pizza. 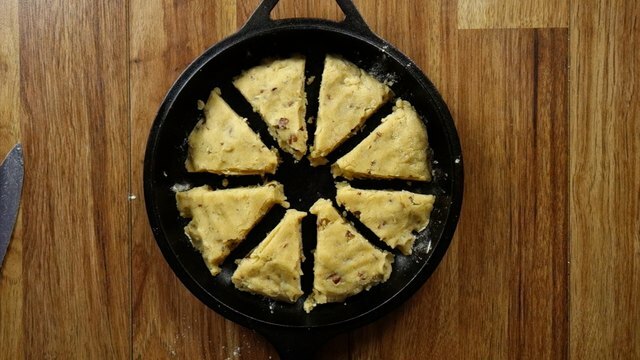 Move your scones apart from each other on your baking surface. 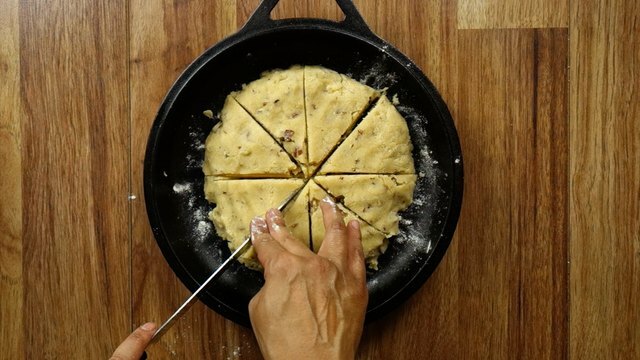 Don’t skip this step, as it will ensure that a lovely crust forms all around your scones. Bake your scones at 350° Fahrenheit for 20 minutes. 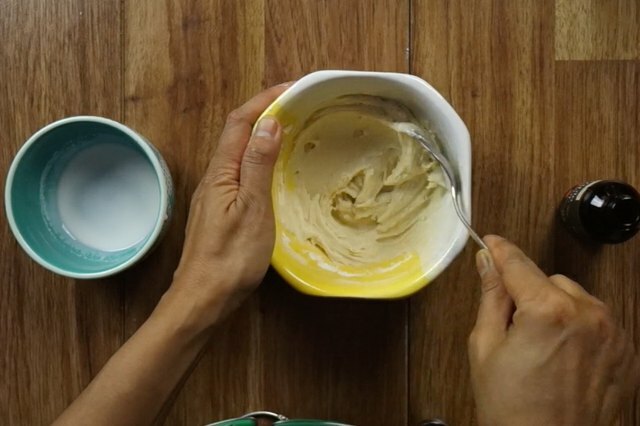 While they're baking, make your maple frosting. If you prefer your scones glazed rather than frosted, use 3 tablespoons of cream and pipe/spread onto your scones while they’re warm (but not hot). The glaze will melt, then set when the scones cool. In a small bowl, combine powdered/confectioner’s sweetener (I prefer Swerve), 2 ½ tablespoons of cream, and 1 teaspoon of maple extract. 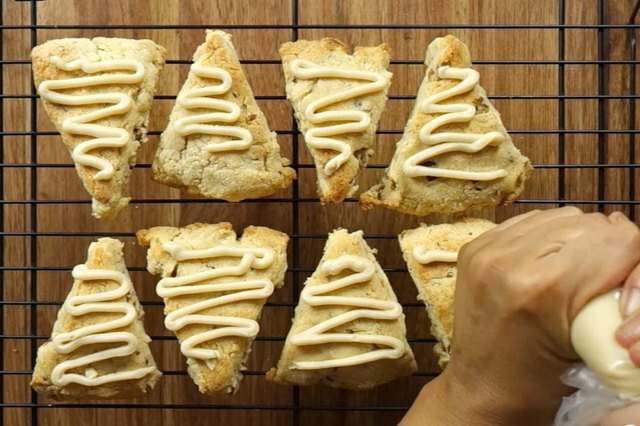 Spoon frosting into a pastry bag and pipe onto scones once they've cooled. 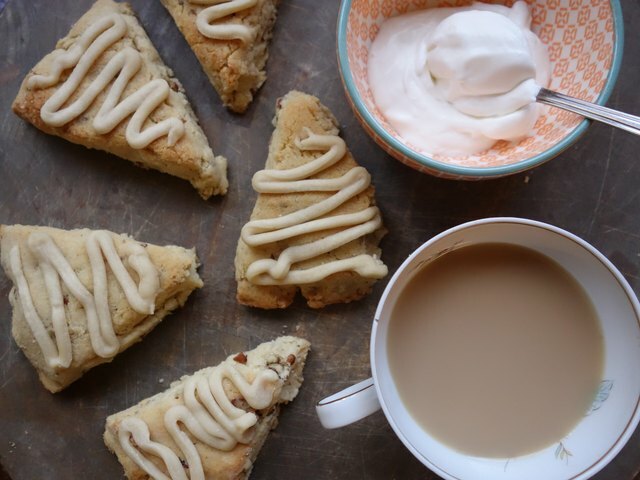 If you're not into piping, you can simply spread the frosting atop your scones. 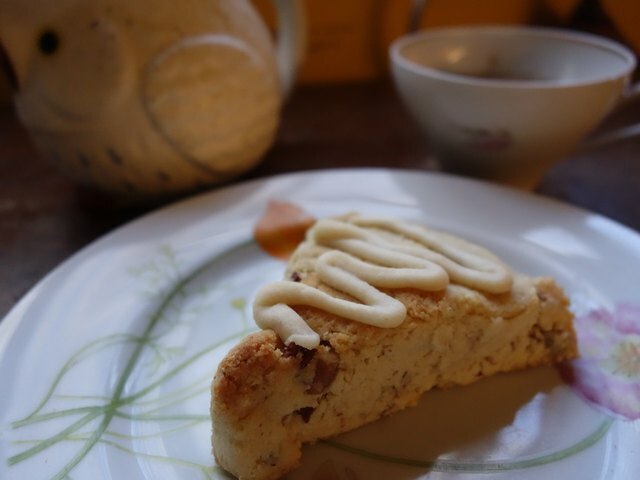 Your scones are now ready to enjoy with a fresh pot of tea, a good friend, and some great conversation.